Maria. Irma. Harvey. Sandy. Katrina. Andrew. For coastal communities, the social, economic, and physical scars left behind by major hurricanes are devastating. 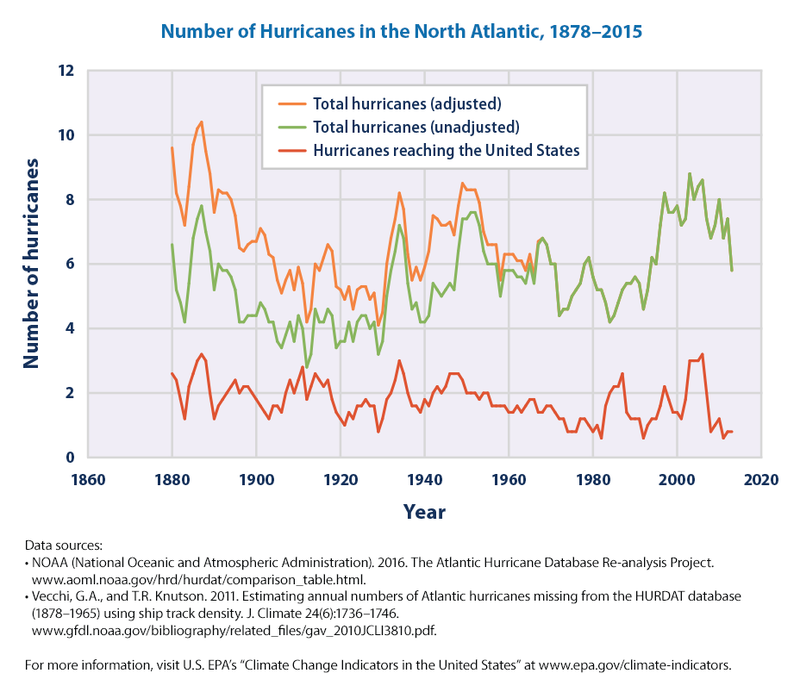 While hurricanes are a natural part of our climate system, recent research suggests that there has been an increase in intense hurricane activity in the North Atlantic since the 1970s. In the future, there may not necessarily be more hurricanes, but there will likely be more intense hurricanes that carry higher wind speeds and more precipitation as a result of global warming. The impacts of this trend are likely to be exacerbated by sea level rise and a growing population along coastlines. Scientists are continuing to refine our understanding of how global warming affects hurricane activity. Cutting edge research is beginning to be able to attribute individual hurricanes to global warming. For example, new research estimates that as the Earth has warmed, the probability of a storm with precipitation levels like Hurricane Harvey was higher in Texas in 2017 than it was at the end of the twentieth century. Because of climate change, such a storm evolved from a once in every 100 years event to a once in every 16 years event over this time period. Photo: Sgt. Jose Ahiram Diaz-Ramos, Puerto Rico National Guard. A hurricane is a rotating, organized system of thunderstorms and clouds originating in tropical or subtropical waters. Hurricanes are classified according to wind speed. The number and strength of storms is highly variable from year to year, which makes it challenging to detect trends in the frequency or intensity of hurricanes over time. The advent of satellite technology in the 1970s made it possible to more consistently track hurricanes. Storm counts and strength measurements from before to the 1970s are less consistent, further complicating the study of long-term trends. To help address these challenges, scientists run hurricane models calibrated with observations over the historical period to project future trends and understand the major factors driving these trends. Recent research in this area suggests that there has been an increase in intense hurricane activity over the past 40 years. 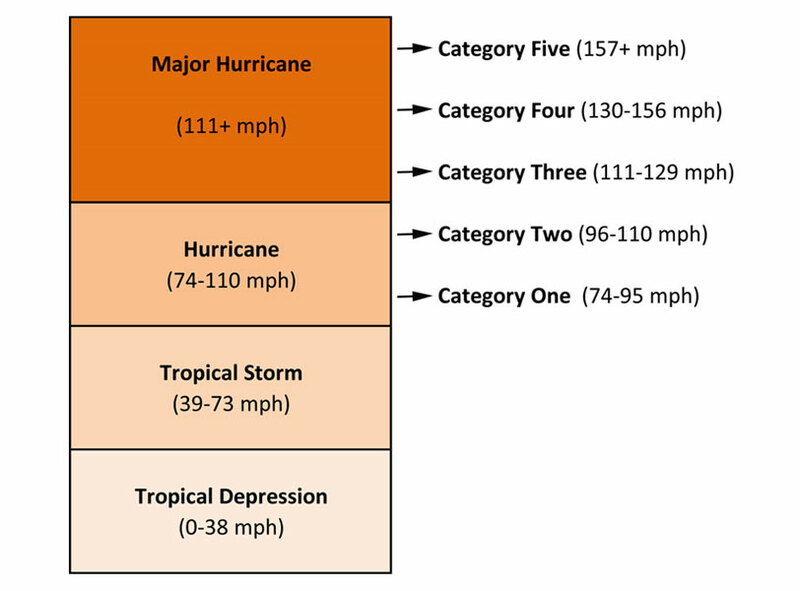 The category system classifies the strength of Hurricanes on a scale from 1 to 5 according to wind speed. Since the mid-1970s, the number of hurricanes that reach Categories 4 and 5 in strength has roughly doubled. Indices for hurricane activity based on storm surge data from tide gauges further indicate an increase in intensity. In 2017, Hurricane Harvey produced unprecedented levels of precipitation. The National Weather Service added two more shades of purple to its rainfall maps to effectively map Hurricane Harvey's rainfall amounts. There is some evidence that in the western North Pacific Ocean, hurricanes—known as typhoons in this region—are also intensifying. Whether hurricanes are intensifying in other regions is less clear, though other recent evidence suggests that the trend toward more intense hurricanes may extend globally. There has been little change, however, in the frequency of hurricanes globally. Roughly 90 hurricanes occur each year around the world, with by far the greatest number occurring in the largest ocean basin on Earth–the Pacific. The oceans have taken in nearly all of the excess energy created by global warming, absorbing 93 percent of the increase in the planet’s energy inventory from 1971-2010. Human-made global warming creates conditions that increase the chances of extreme weather. In some ocean basins, the intensification of hurricanes over time has been linked to rising ocean temperatures. Since 1970, sea surface temperatures worldwide have warmed by about an average of 0.1°C per decade. This warming is especially pronounced in the North Atlantic basin. 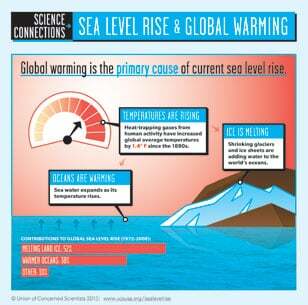 Sea levels are also rising as the oceans warm and seawater expands. This expansion, combined with the melting of land-based ice, has caused global average sea level to rise by roughly 7-8 inches since 1900—a trend that is expected to accelerate over coming decades. Higher sea levels give coastal storm surges a higher starting point when major storms approach and pile water up along the shore. The resulting storm surge reaches higher and penetrates further inland in low-lying areas. The risk is even greater if storms make landfall during high tides. Roads and other crucial infrastructure face growing risks from storm surges. Growing population density on coastlines also increases the destructive potential of hurricanes. Roughly 40 percent of the US population—about 123 million people—lives in coastal counties. US coastal county populations are growing much denser than non-coastal counties. Between 1970 and 2010 coastal counties increased population density by 39 percent (excluding Alaska). In non-coastal counties, population density hardly changed over the same period. 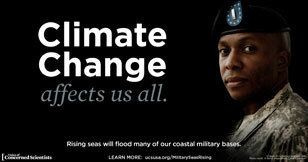 By concentrating ourselves along the coasts, we have increasingly exposed our communities and homes to powerful storms. As a result of coastal development, storms are exacting rising financial tolls. Warm ocean temperatures are one of the key factors that strengthen hurricane development when overall conditions are conducive for their formation and growth. Hurricanes require high humidity, relatively constant winds at different altitudes, and can occur when surface ocean temperatures exceed about 79°F (26°C). The rising of warm, moist air from the ocean helps to power the storm. In order to build up and intensify, hurricanes require warm ocean temperatures, moist air, and low vertical wind shear (i.e. no strong change in wind speed or direction between two different altitudes). Two other factors may also be contributing to the rising intensities of hurricanes. First, warm air holds more water vapor than cold air—and the rising air temperatures since the 1970s have caused the atmospheric water vapor content to rise as well. This increased moisture provides additional fuel for hurricanes. Climate models project an increase in the average precipitation rate of hurricanes as a result of global warming. Second, as ocean temperatures rise, there is also less cold, subsurface ocean water to serve as a braking mechanism for hurricanes. When strong storm winds churn up cold subsurface water, the cooler waters can serve to weaken the storm. But if deeper waters become too warm, this natural braking mechanism weakens. For example, Hurricane Katrina intensified significantly when it hit deep pools of warm water in the Gulf of Mexico. Not all changes in climate will fuel hurricanes. For example, when there are large changes in wind speed at different altitudes (also known as "vertical wind shear") above an area of the ocean, those conditions can interfere with hurricane formation. There is evidence that climate change may increase vertical wind shear over some regions in the western tropical Atlantic Ocean. However, when scientists put the pieces together, they project that in general, hurricanes will become more intense in a warming world, with higher wind speeds and greater levels of precipitation. The largest Atlantic hurricane on record, Hurricane Sandy reached over 1000 miles in diameter and made landfall in the U.S. on October 29, 2012. The oceans experience a variety of natural circulation patterns, or oscillations, that influence the distribution of warm and cold water in the upper ocean. These naturally occurring oscillations affect ocean conditions on timescales ranging from just a few years to several decades and are known to affect the intensity of hurricanes. During the warm, or El Niño, phase of the El Niño Southern Oscillation (ENSO), for example, hurricanes are less likely to make landfall in eastern Australia and Atlantic hurricanes tend to be suppressed. However, El Niño conditions can boost typhoon risks in parts of Asia. The presence of these natural oscillations can mask or enhance the potential influence of human-caused warming on hurricane activity. Recent scientific studies increasingly question whether human activities have contributed to observed shifts in natural circulation patterns. The aftermath of Hurricane Sandy in Mantaloking, New Jersey. As the climate continues to warm, the average intensity of tropical cyclones (including hurricanes in the North Atlantic) is projected to rise while the overall number of hurricanes globally is expected to either decrease or remain unchanged. Scientists project that, on average, tropical cyclones and hurricanes will have higher wind speeds and higher precipitation rates. There is some evidence that there will be an increase in the frequency of the most intense storms, though there is more evidence of this finding for the eastern North Pacific than there is for the western North Pacific and Atlantic. The projected increase in intense hurricanes is substantial—a doubling or more in the frequency of category 4 and 5 storms by the end of the century—with the western North Atlantic experiencing the largest increase. With continued warming, sea level is likely to rise by one to four feet globally by the end of the century, enabling the powerful surge associated with hurricanes to penetrate further inland than today. Given the loss of life and the huge costs of rebuilding after hurricanes, it is essential to do whatever we can to avoid dangerous warming and protect coastal communities for ourselves and our children. Recent experiences with super storms like Sandy in 2012, Harvey, Irma and Maria, all in 2017, have left some valuable lessons: We can’t afford to ignore global warming. Investing for the present and future of a changing climate is pressing. How are we preparing our communities, and making sure that we don’t leave people behind? What actions are we taking to mitigate climate change and avoid its worse projections?